Academy of Regenerative Medicine IS A LEADER IN REGENERATIVE TECHNOLOGIES! 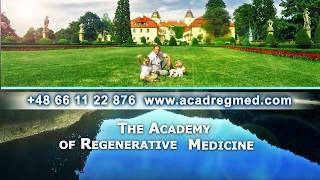 Academy of Regenerative Medicine is a training, research, medical, recreational, regenerative and gerontology (rejuvenation) institution, founded in Swiebodzice, Poland in 2010. In a short period of time Academy of Regenerative Medicine gained worldwide fame and became one of the leading medical centers in Europe. Patients from 30 countries (the USA, Canada, Australia, Israel, EU, CIS, Asian and African countries) have already undergone successfully their treatment and regeneration in our center. The Academy of Regenerative Medicine is not only a leader in preventing and treating many chronic incurable and genetic diseases but the only center in the world in which the integrated method of body regeneration with the help of simple harmless natural techniques is implemented and widely used. A promising new direction in complementary and regenerative medicine was developed, proven and implemented in practice in our center. The invaluable advantage of this technique is the rapid restoration, regeneration and rejuvenation of the body in so much that our patients in any condition and at any age almost completely stop taking any medications, including painkillers, food supplements. They also stop restricting their food and keeping to any diet. THEY LIVE A FULL LIFE WITHOUT DISEASES AND MEDICATIONS! The Academy of Regenerative Medicine works on the basis of the author’s method of Aliaksandr Haretski «The method of human organ regeneration, biological body rejuvenation, integrated healing of chronic “incurable” diseases and aging with the help of regenerative medicine techniques». You can get acquainted with the basic elements of our method on the official website of our Academy www.acadregmed.com We have posted lots of practical information there. You can learn how to effectively cleanse the body of harmful toxins and parasites, how to eliminate the main causes of diseases and boost the immune system. You can also learn how to launch the mechanisms of body regeneration and self-healing in sick people with various severe diseases. OUR REGENERATION METHOD IS UNPARALLELED ANYWHERE ELSE IN THE WORLD! Our Academy of Regenerative Medicine is the only health care institution in the world in which only harmless natural methods of treatment and our own know-how developments are used. It allows us to achieve such incredible results in treating many diseases. Our method, the only effective one for treatment of many incurable diseases, is YOUR LIFE WITHOUT DISEASES AND MEDICATIONS! The uniqueness of our method is that it allows us to stop the aging process and replace the name of many “incurable diseases” with “curable diseases”. The use of this technique offers an opportunity to give people a new lease on life at minimal cost. It’s universal and harmless. It has virtually no contraindications. It can be effectively used not only for prevention and treatment of many diseases but also for body rejuvenation at any age. The positive side effect, which manifests itself as the regeneration and rejuvenation not only of the skin but also of the whole human body, means that this is the best place on earth to relax and improve your health and beauty. After undergoing treatment in our Academy, every person looks and feels healthy and many years younger without any plastic surgery. We invite you to see it for yourself! The Academy of Regenerative Medicine has earned high accolades and recognition from its patients all over the world owing to our highly professional specialists, our high level of customer service and the possibility of comprehensive disease treatment. The staff of our center speaks Polish, Russian, English and many other languages fluently and provides high-quality assistance to patients from any country. The cost of our services, compared with the cost of services of other medical centers in European countries, the USA, Japan and even China, is tens or even hundreds of times lower than when using other methods of treatment of incurable diseases. Our prices are lower but the effectiveness is higher! A HIGH QUALITY OF LIFE AFTER THE BODY REGENERATION! The important advantage of our work is a high quality of life of our patients after their treatment in our center with healthy organs and rejuvenated cells in the whole body, with a strong immune system, without diseases and drugs. Our Academy is located in the foothills area in the south-western part of Poland. The main advantages of this region are clean air and a mild climate with favorable weather conditions all the year round. We offer comfortable self-catering accommodation with home atmosphere in well-equipped one bedroom and two bedroom apartments with a bathroom and a kitchen in our center. It allows our patients not to feel like staying in hospital and provides psychological comfort. HOW TO CHOOSE A COURSE OF REGENERATIVE THERAPY CORRECTLY? After getting acquainted with the information posted on our website www.medycynaludowa.com many people think that we are wizards and within a week we can eliminate big problems that have existed for many years. Sometimes very quick fantastic results are achieved in our center - God works miracles, but this is an exception. In most cases, we and our patient must work hard and long hours with the help of God in order to achieve a goal. Our task is to cleanse the body and make it replace its old, sick and damaged cells with young and healthy ones. The regeneration process of the very damaged and weakened body is very time consuming. We can only recommend the right course of regenerative therapy for you. The choice always remains with the patient and depends on his faith, desires and possibilities! And thereby the result depends on your choice! YOUR DESTINY LIES IN YOUR HANDS! THE LIST OF DISEASES WE TREAT! THE COST OF THE COURSE OF REGENERATIVE THERAPY! In most cases, patients who come to our Academy are interested in treating only one organ, more affected by their diseases . But we are engaged in health improvement and regeneration of the whole body rather than its separate damaged parts. People die not of old age, but of diseases. We have found a universal way how to get rid of chronic and incurable diseases and prolong people’s lives for long. Our method of whole body regeneration is not a theory. It is tested and successfully used in practice. To do the full body cleanse, encourage the body to heal itself and halt the progression of many diseases. It may be said without exaggeration that it is the best way to regenerate the human body, prevent various diseases and stop the aging process: 13-30 - day programs. 1+ to halt the progression of the disease or get rid of it in the case of mild and intermediate forms of «incurable» diseases: 30-60- day programs. 1 and 2+ to get rid of diseases in the case of severe «incurable» and even genetic forms of diseases, to regain previously lost functions, to launch the process of regeneration and rejuvenation in elderly and seriously ill people, as well as patients who need organ transplants without any transplant surgeon only with the help of our method of whole body regeneration: a few courses of 30 – day or 60 – day programs or a 365 - day program. The cost and duration of a course are determined individually for every patient by the specialists of the Academy and depend on the patient’s state of health. The basic prices on the basis of which the cost of services is calculated are shown below. The Cost of Services in the Academy of Regenerative Medicine, Swiebodzice, Poland. 25% off accommodation when staying in the same room for 2 or more people. The cost of a course can be determined individually for patients with some incurable diseases. Discounts can be offered for our regular customers who are engaged in charity activities of the nonprofit organization «YOU GIVE LIFE» (Poland) and assist organisational issues, who assist the Academy of Regenerative Medicine. Limited number of seats. Prices are valid only under condition of 100% prepayment until 01.05.2019. The reservation fee for a course of regenerative therapy is EUR 400 per patient. If a patient comes to the Academy of Regenerative Medicine on the stipulated date the reservation fee will be adopted as a part of the cost of the course of regenerative therapy paid in advance. If a patient doesn’t come to the Academy on the stipulated day of arrival it will be considered as a non-refundable reservation fee. If you want to be placed on a waiting list you will have to fill in the form “An advance reservation of a course of regenerative therapy!” on our website. You can also ask us your questions about your visit to our Academy by e-mail: reservation@acadregmed.com or by phone: tel., Viber, WhatsApp: +48732027579. Contact person: Maryna Charnenka, vice director. Every applicant must provide detailed information about himself and his health problems. SO AGAIN, HOW TO CHOOSE A COURSE OF REGENERATIVE THERAPY CORRECTLY? REMEMBER! YOUR DESTINY LIES IN YOUR HANDS!